I'm receiving an error whenever I attempt to delete an image with the Asp.net version of CKFinder 2.3. Exception of type 'CKFinder.Connector.ConnectorException' was thrown. Exception Details: CKFinder.Connector.ConnectorException: Exception of type 'CKFinder.Connector.ConnectorException' was thrown. I can create images, rename them, copy them, create folders... but can't delete. Just to better understand the problem: did you have older versions of CKFinder installed on the same server and they worked properly? Did the error start happening straight after the upgrade to 2.3? I can't say for sure if an older version worked or not. I don't recall ever having this problem before. It could be a server-related issue, but it seems funny to me that I can create images, rename them, copy them, create folders, but can't delete anything. 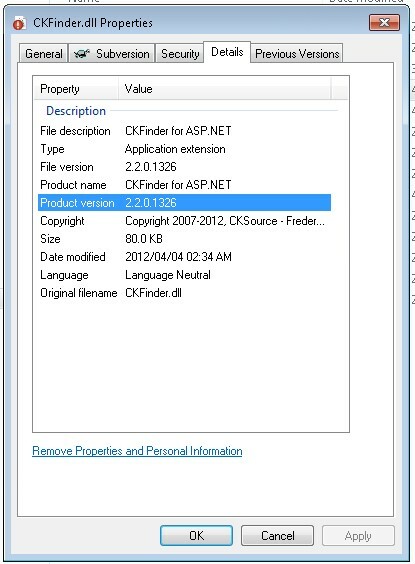 I have found that if you use the version 2.2.0.1326 of the CK Finder for ASPNET dll, I did not experience this issue. Any add-ons need to be from the same version download folder.